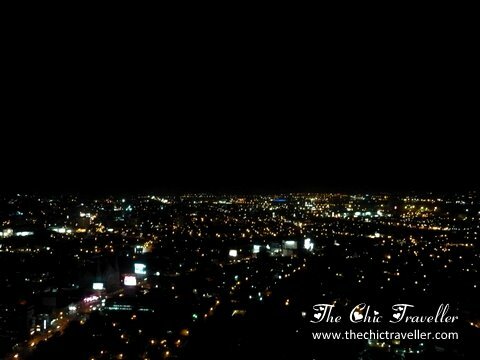 The Chic Mompreneur: I Survived the Philippines' First Skywalk Extreme! I Survived the Philippines' First Skywalk Extreme! Have you ever wondered what would it feel like to walk on clouds? If you did, you have got to try Club Ultima's Skywalk Extreme. Skywalk Extreme is the one of the hottest attractions of Club Ultima, a skyrise condominium that's being developed as a tourist hotspot in Cebu. What is it about? It's simply walking around the edge of the building on a narrow platform with only a harness to keep you safe. Located at the 37th floor, the guests are treated to a visual delight of Cebu on top of one of the tallest buildings in the city. While walking around, you'll have fun guessing the landmarks of the city. You'll see a wonderful view of the Capitol, Fuente Osmena Circle, South Reclamation Project and many more. If you're lucky, you'd even get to identify your house if it's nearby. The walk lasts about 15-20 minutes, and there's a tour guide to accompany you. Don't worry about taking pictures. There's a designated photographer that will be your paparazzi for the night. The experience is definitely unique. It's best to try it with your family or closest friends. Even those who were afraid of heights found the courage to go through the Skywalk with us when we convinced them that everyone's going together anyway. It's now difficult to identify them in our group pic because everyone had their best smile when the photographer took this shot. We all had fun at the Skywalk Extreme, even if the second half of the experience was already a bit boring. For Php600 rate that comes with a buffet dinner, the Skywalk Extreme is good for a one time experience only. 1. You will be asked to wear a suit and harness for the Skywalk Extreme. Be sure to wear your own sneakers so you will not be asked to borrow the shoes they have instead. When we were there, they even ran out of socks. To be safe, wear sneakers or rubber shoes. They won't accept closed leather shoes as well. 2. Keep your valuables safe. You will be provided a locker where you can store your things and valuable items like jewelry, watch, and others. 3. Do this before your buffet dinner. You wouldn't want to risk wasting your meal if you find yourself disliking the experience. whoa! i really want to do that. if ever i go back to cebu this year, that'll be the first thing ill be doing including the edge coaster! Galing! Thrilling ba? I'll try this for sure when I visit Cebu again. yey, my friends and I are going there on September. your post makes me want to go there now. hahaha!